A train with mechanical problems probably caused a fire that forced the evacuation of a small Haskell County town last weekend. 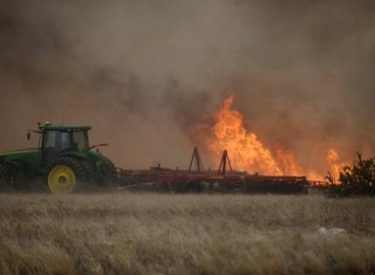 Stevens County officials say the train sparked a blaze Sunday along railroad lines, which are surrounded by pastures and grasslands. Fueled by tumbleweeds and winds that reached 60 mph, the blaze grew and eventually forced the evacuation of about 1,200 people in the Haskell County town of Satanta. The blaze damaged a few homes and burned about 1,000 acres, but no major injuries were reported. It began about noon Sunday and firefighters had it under control about 8 p.m. The total damage estimate has not been determined.